The GC-MT 1636/1 tiller is a powerful gardening tool for highly effective soil cultivation for the ambitious garden-lover. 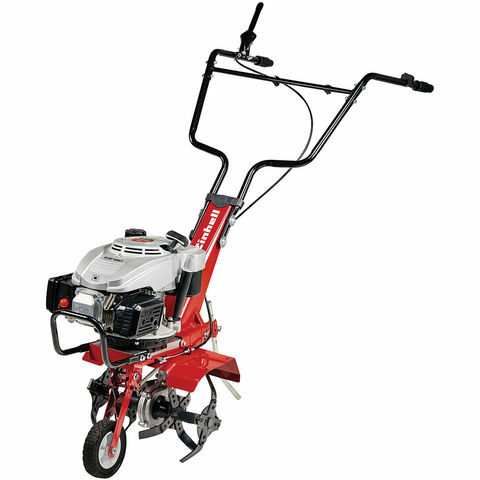 The one cylinder four-stroke engine with crank shaft with bilateral bearings provides a strong working performance and quiet running, whereby the robust choppers provide a fast working progress of the rotary cultivator in firm soil.For the safe operation, the device is equipped with a blade stop. The stable pivoted guide wheel cares for comfortable and effortless relocation and due to ergonomical, height-adjustable guide handles, the tiller can be adjusted optimally to the operators height.